Strong, soft tissues for the house! Tempo has taken your favorite facial tissues (extra thick, soft, fluffy, "soak-through secure" and your nose's best friend!) and is now offering them in a decorative box for home use. There are 80 tissues per box, and various box designs are available. Tempo celebrated its 80th anniversary in 2009, so for over 80 years people have relied on the proven quality of Tempo tissues. 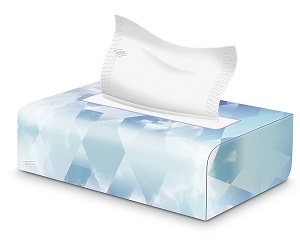 These extra thick, soft and fluffy tissues are popular classics that provide reliable protection whether used in the personal emotional moments of everyday life, or for colds and allergies.